Info "Bow with everyone else! Just because you’re Wario doesn’t mean you get preferential treatment!" Closing Night is one of Tiny Wario's Microgames in WarioWare: Smooth Moves. 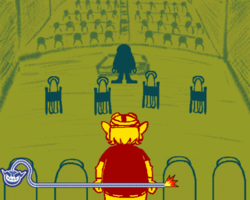 The player must bow at the right time as Wario with the others. 1st level difficulty: The player will be instructed when to bow. 2nd level difficulty: The player will be instructed when to bow and when to stand (by tilting the Wii Remote back upwards). 3rd level difficulty: The player will have to bow and stand with the others uninstructed. This page was last edited on February 20, 2018, at 18:04.